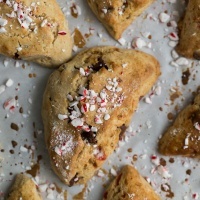 Chocolate Chip Peppermint Scones | Naturally.Chocolate Chip Peppermint Scones | Naturally. In a large bowl, whisk together flours baking powder, and salt. With your hands or a pastry blender, cut the butter into the flour mixture. Flour mixture should be in pea size pieces. Stir in the chocolate chips and crushed peppermint. In a separate bowl, whisk together the mample syrup, heavy cream, egg, and peppermint extract. Pour into dry ingredients and stir until just coming together. Scoop dough onto a well floured surface and pat into a rectangle (roughly 8″ x 6″). Cut in half, then cut each of the sides in half and finally, cut the remaining 4 pieces in half, on the diagonal to create triangles. Place on a sheet tray covered with parchment paper. Whisk together egg and heavy cream then brush over scones. Bake for 20-24 minutes until scones are golden and firm. Remove from oven, sprinkle with extra crushed peppermint/candy cane and let cool before eating.